Carol loves to cook and Marc loves that Carol loves to cook. Because it actually is something to do, not cooking for a while can result in withdrawal anxiety. Our Lao journey started in Luang Prabang and by the time we arrived in Nong Kiau, I hadn’t cooked a meal for more than a week. Nong Kiau is about four hours by road from Luang Prabang, the cultural capital of the Lao People’s Democratic Republic. It is somewhat of a transit town; one could take a boat to Vietnam and even China from here. With the “Sleeping Lady” mountain or Mountain of the Sleeping Woman providing a near-perfect backdrop, Nong Kiau cradles the Nam Ou (pronounced “ooo”) or Ou River, which is a tributary of the great Mekong. We chose Nong Kiau Riverside Resort at which to spend our five days in Nong Kiau and it turned out to be a very wise decision. We couldn’t have asked for a more comfortable stay. Although we hadn’t booked a cooking class in advance, we did so the minute we checked in. Lao cuisine is quite similar to the Thai and Vietnamese – lots of fresh herbs and grasses, generally low-fat and generously spicy. The smaller the chilli, the more potent. Our private cooking class was conducted by the fabulous Noy, also the resort’s manager. Noy had an almost over-the-top demeanour - throwing his hands and head back as he shrieked with laughter, being super efficient at everything and showing us photos of his celebrity years as a national volleyball player. Yup. He learned to cook at his mother’s elbow. 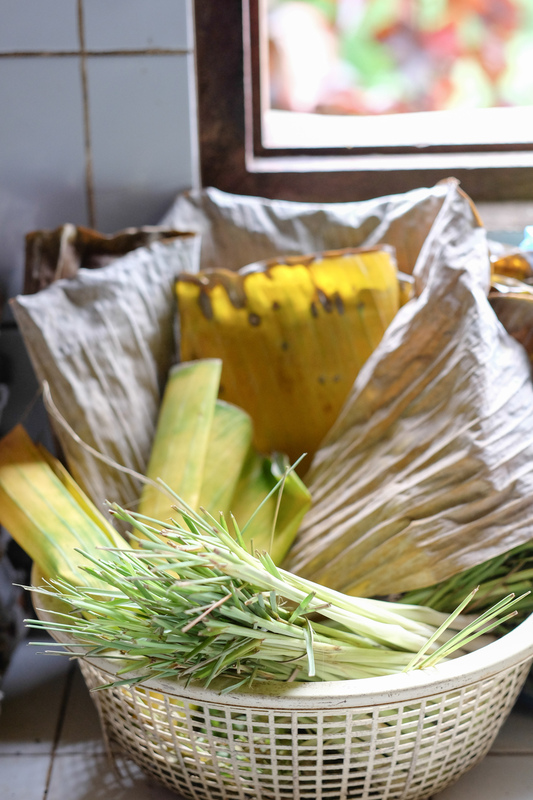 In the resort’s modest but highly effective kitchen, we chopped banana flowers and brinjal (eggplant/aubergine), pounded shallots and lemongrass, and stirred kaffir lime leaves (or “daun limau purut” as my mother taught me to say in Malay) into a gorgeous coconut-base fish curry. Although I sometimes struggle with strictly adhering to my vegetarian diet, it doesn’t fail to amaze me when people ask, But fish is OK, right?” Given that we were cooking a lunch for Marc as well, fish had to become OK.
With its two big windows, with real sills that overlooked the lazy off-season Nam Ou; with the fragrance of fresh mint leaves and dill in the air; and with the hospitality of Noy and his team, I could have stayed in that kitchen for hours. I’m typically a functional cook. Nong Kiau Riverside Resort’s kitchen made me want to be an indulgent cook. 2. Nong Kiau Riverside Resort (nongkiau.com) About 400,000 kip per night per bungalow. 3. Boat from Nong Kiau to Muong Noi 25,000 kip per person. About 50 minutes. 4. Bus to and from Luang Prabang From 80,000 kip per person depending on vehicle type. About 4 hours.